Enter a Name and/or Date to be printed on your pillow cover. Enter "NO" if you don't want it personalized. You’ve reached the limit! Use 50 characters or less. 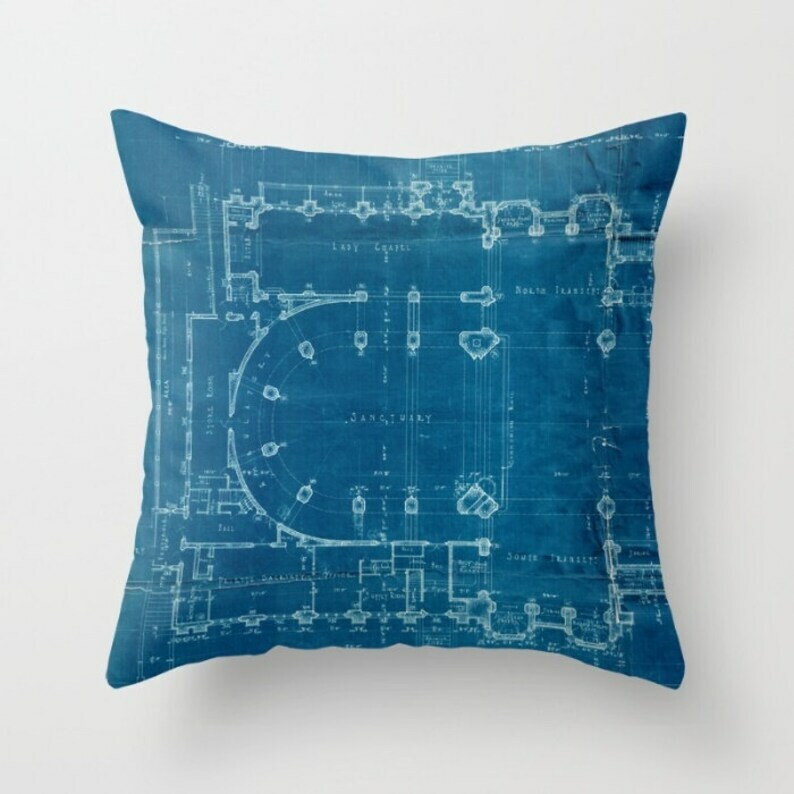 This awesome Church Blueprint Floorplan from 1923, San Francisco, Throw Pillow Cover is part of the Architectural Pillow Series. Our Accent Pillows make a stylish statement that will liven up any room. - Water Proof Spun Polyester. Please pick your size and fabric from the drop down menu. Individually cut and sewn by hand, the pillow cover measures 14" x 14", 14" x 20", 16" x 16", 18" x 18", 20" x 20" or 26" x 26" depending on the size you choose, features a double-sided print and is finished with a concealed zipper for ease of care. All Pillow Covers are made to Order. Thank you for shopping at BACKtoBASICSpillows! These arrived quickly and are exactly the color described. We love them! Item came on time and looked just as it did on the web site. I accept payment via PayPal and credit card. To pay with a credit card, just click the Checkout with PayPal button and you'll then be able to enter your credit card info. VISA, AMEX, MasterCard, and Discover are accepted. All BACK to BASICS pillows items are made to order. I will only refund an item if it arrives damaged. There are no exchanges. No returns will be processed after 48 hours after you received the item, so please open your package and inspect the product promptly upon receipt. Cancellations- Etsy has this as an option to REQUEST a cancellation and it will NOT cancel your order, only send a request. Please know that due to the way I process my orders, cancellation requests will not be processed so please double check before you order! Once an order is placed it will ship. BACK to BASICS pillows is not responsible for lost, stolen or undelivered packages. All lost, stolen, and undelivered packages without insurance are the responsibility of the buyer. - I'm unable to replace or reship items purchased without insurance. - If you want to purchase insurance you may do so by contacting me prior to ordering. - I will ship to the shipment address listed in the order confirmation. - Any packages returned due to wrong or incorrect addresses will be reshipped at the cost of purchaser. Leaving me feedback? Please do so! However PLEASE remember this is my livelihood and anything negative hurts not only my business but my opportunities to grow. I am pretty reasonable to work with and will make any mistake or issue right...so please, be nice. YES, I wholesale. Convo me or email me.